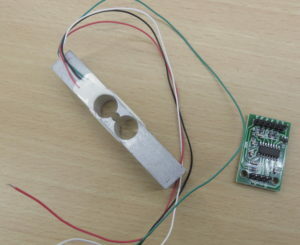 In this tutorial, it is shown how to utilize an Arduino Uno, a HX711 breakout board, and a load cell in order to measure weight. 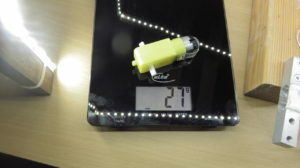 Moreover, an LCD module of type LCM1602 IIC V1 is used to display the measured weight. A load cell (left hand side) and an HX711 breakout board (right hand side). The HX711 is a 24-bit analog-to-digital converter which fits perfectly to weight scale applications. Fortunately, there exist many breakout boards for the HX711. Therefore, it is very easy to use it in combination with a so-called load cell. Load cells are transducers that convert pressure/force into an electrical signal. As the electrical signal has typically only a few millivolts, it has to be amplified. And that’s where the HX711 breakout board comes in: as it amplifies the weak signal to a few volts so that we can read the signal with the help of an Arduino Uno. In order to easily connect the load cell to the pins of the HX711 module, you can add DuPont connectors to the wires. This step is totally optional. You can use whatever you want to connect the wires to module’s pins. If you use DuPont connectors, keep in mind that such load cells often have thin single-strand wires. 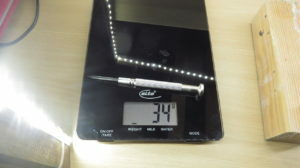 I used the help of some solder to attach the thin wires more tightly to their connectors. Preparation of crimping tools, raw connectors, and shells in order to add DuPont connectors to the wires of the load cell. 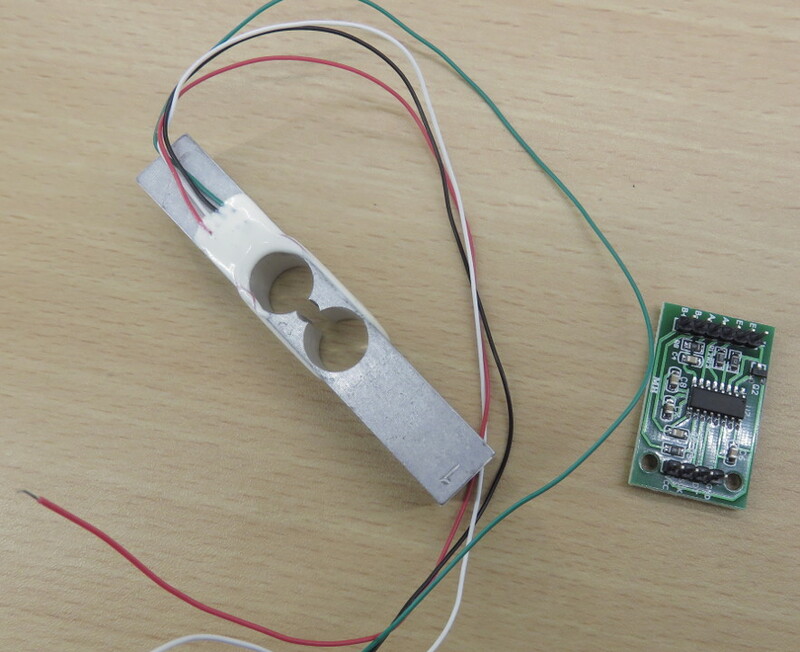 As a result, the load cell can be easily connected to the HX711 breakout board. 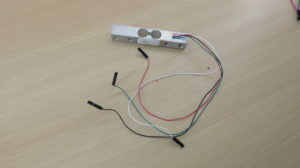 Load cell with DuPont connectors. 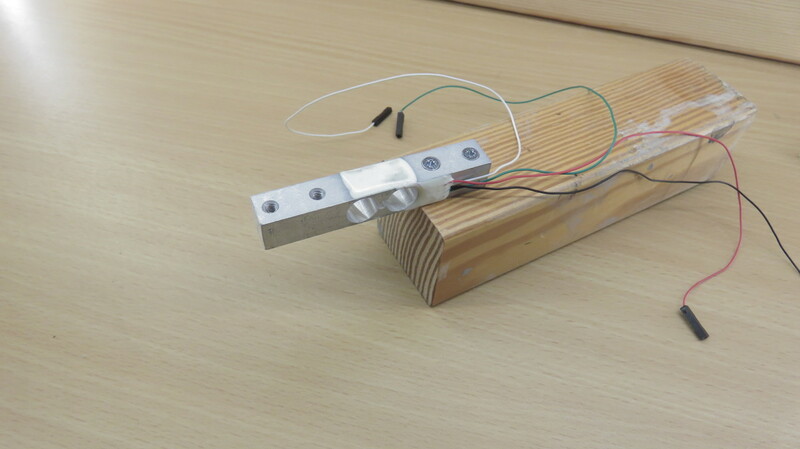 Load cell mounted on squared timber. Fritzing file that shows how to connect the load cell to the HX711 module. 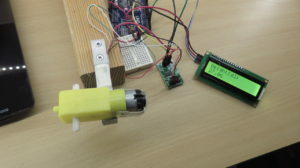 Moreover, it is shown how to connect the HX711 module and the LCM1602 IIC v1 (LCD) module to the Arduino. 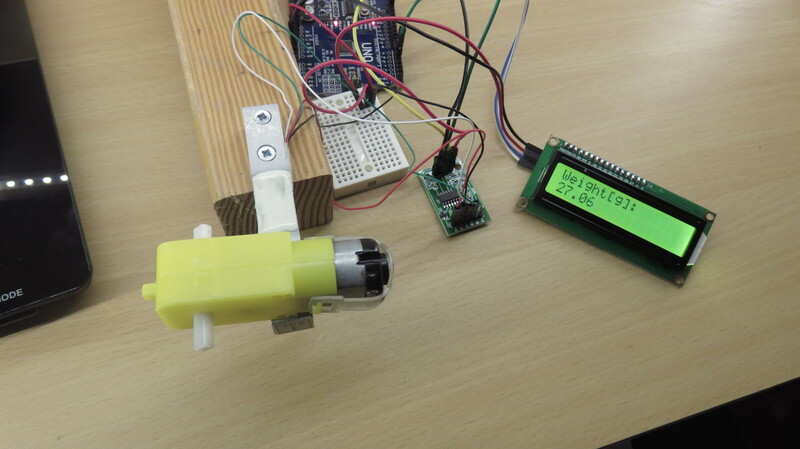 First, the load cell is connected to the HX711 module. 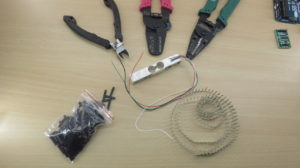 The load cell has four wires, which must be connected to the first four pins of the HX711 module: Red wire to E+, black wire to E-, white wire to A-, and green wire to A+. The remaining pins, B- and B+, can be used if a second load cell has to be connected to the HX711 module. Next, the HX711 module is connected to the Arduino Uno. The module’s GND pin must be connected to the Arduino’s GND pin. 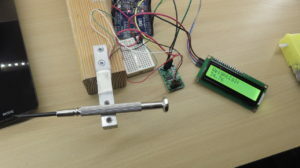 DT and SCK must be connected to digital pins of the Arduino. In this tuorial, DT is connected to digital pin #4 and SCK is connected to digital pin #5. The remaining pin VCC must be connected to the 5V pin of the Arduino. As the LCM1602 module requires also a connection to the 5V pin, a breadboard is used in-between to split the Arduino’s 5V signal. As a last step, the LCM1602 module’s SDA and SCL pins must be connected to the corresponding SDA and SCL pins of the Arduino Uno. Moreover, the GND pin must be connected to one of the Arduino’s GND pins and the VCC pin has to be connected to the 5V signal of the breadboard. Then I put the dc motor on my weighing scale. Next, I adapted the parameter of the setCalFactor method (see setup function) until the correct weight was shown on my weighing scale. Keep in mind, each load cell and setup needs a different calibration factor. Therefore, it makes no sense to tell you mine. This entry was posted in Development on December 4, 2017 by mschoeffler.